Even before he arrived in San Antonio Chris Cooper was obsessed with going to Mexico. Over time he became increasingly frustrated because each time he attempted to make the trip, something would happen to cause a change in plans. His excitement was almost overwhelming when he found out that KONO was going to be a sponsor for the Border Rallye between San Antonio and Laredo. Chris WAS determined to do whatever it took to be a participant because it would finally give him the chance to make his Mexico trip. Chris was even more excited when KONO Program Director Rick Reynolds selected Chris to be his navigator because it meant he would finally actually be able to make the dream trip he wanted. 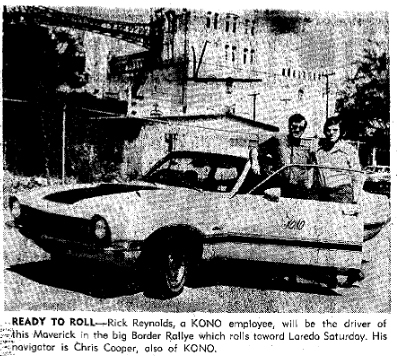 The KONO sales department had Patsy Young and Kay Wells as participants, but the sponsors wanted more of the KONO air staff to participate in the Rallye so I volunteered. However there was a problem that had to be solved. None of the rest of the KONO air staff would be available to participate with me because of air shift scheduling issues since the event would occupy most of the weekend. While mulling over the issue I encountered Ed Tree, KITY Program Director and I queried him for ideas. Ed suggested that Paul Kirby would work scheduling wise, but sleep wise it would be rough on Paul since he would be getting off his air shift on KITY at 2 AM Saturday Morning and my scheduled start in the Rallye was at 7:40 AM less than 6 hours later. 7:40 AM on Saturday found Paul and me heading North out of San Antonio, rather than South toward Laredo for the start of the Rallye. Late afternoon we finally made it to the final checkpoint in Laredo at a car dealership there. What I found very ironic was that the background music at the final checkpoint was KITY and NOT KONO! After completing the final checkpoint paperwork, we immediately headed to the hotel. Paul desperately needed some crash time before the events happening later than evening. Paul was “out” almost immediately after we checked into our room. I didn’t want to disturb him so I headed to the lobby to see if I could help with things that were scheduled to happen later that evening. As I walked into the hotel lobby Chris accosted me. The dealer car that Rick and Chris had used for the Rallye was not yet registered and didn’t have license plates, so Chris could not use it to go to Mexico. I was not about to wake up Paul. He needed his sleep. Chris would just have to wait a bit longer. I cannot ever remember seeing Chris more excited at any time then when he heard Mike’s announcement! Bill “Hoot” Gibson KONO Engineer also accepted Mike’s invitation. We all piled into Mike’s car and headed to Mexico. Chris was a kid at Christmas wondering around the marketplace and shops in Nuevo Laredo. He bought all kinds of trinkets and souvenirs which got to be so many that Bill and I had to help by carrying some of his items. Suddenly Chris informed all of us that he was VERY HUNGRY and needed some food IMMEDIATELY! “Those sure were good tacos. What kind of tacos were they?” Chris inquired. Almost immediately everything that Chris had ingested into his stomach was now on the street. Copyright 2017 by John Steel & SanAntonioRadioMemories.com – All Rights Reserved.